The correction of Class II malocclusion in adult patients can be challenging because of the complexity of dentition. Currently, Class II malocclusion in adult patients is corrected by surgical mandibular advancement, by extraction of premolars or by using intraoral distalizers. The surgical option is ideal for patients with retrognathic mandible, while the extraction option is ideal for patients with severe crowding and protrusion.1,2 The intraoral distalizers have been used in some adult cases.3 In this report, we describe a nonextraction and nonsurgical method of correcting Class II malocclusion in an adult patient using microscrews. Fig. 1. Pretreatment pictures and X-rays. A 26-year-old patient was referred to the clinic by her general dentist. Her chief complaint was, “I don’t like my teeth.” Clinical exam showed severe crowding in maxillary and mandibular arches. The dental arch forms were square in shape and her smile showed dark corridors. She had dental Class II, Division 2 malocclusion with impinging deep bite. The mandibular anterior teeth had worn out incisal edges. 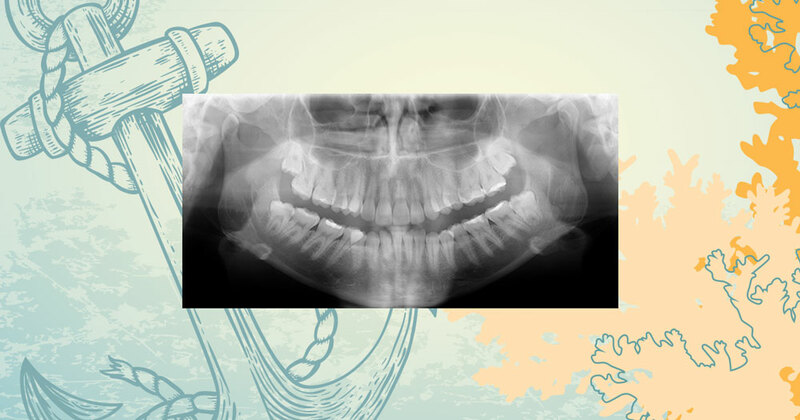 The panoramic X-ray showed impacted third molars, and cephalometric analysis showed a skeletal Class II relationship with an ANB angle of 4.7 degrees, retrognathic mandible, normal facial proportions, retroclined maxillary and mandibular anterior teeth (Fig. 1). Distalizing maxillary molars using microscrews. Extraction of mandibular first premolars and surgical mandibular advancement. Extraction of maxillary and mandibular first premolars. Extraction of only maxillary first premolars, with interproximal reduction in the mandibular arch to relieve crowding. Patient did not want either surgery or extraction option. She said that her brother had the same bite as hers and had undergone an extraction treatment plan with another orthodontist, but she did not like the aesthetics of his final smile result. Therefore, the patient chose the first option. Radiance brackets from American Orthodontics with 0.022 MBT prescription were bonded on maxillary and mandibular arches. Sectional wires were placed in the maxillary arch from upper canine to canine, and bilaterally from first premolar to second molars. Sectional archwires were used to prevent the resistance from sliding mechanics. For efficient leveling of the Curve of Spee, mandibular second molars were also banded. A continuous archwire was placed in the mandibular arch. Initial archwires were 0.014 nickel titanium (NiTi), followed by 0.016 NiTi and then 0.018 stainless steel (SS). The maxillary 0.018 SS archwire was left 3-4 mm longer distal to the second molars to keep the molars in archwire during the distalization process. Passive NiTi coil springs were added bilaterally between maxillary second premolars and first molars, and between first and second molars. Fig. 2. Intraoral pictures showing position of microscrew. When patient was in 0.018 SS wires, she was referred to an oral surgeon for placement of microscrews and extraction of maxillary and mandibular third molars. Microscrews were placed bilaterally at the buccal/mucogingival junction between maxillary first molar and second premolar (Fig. 2). An elastic chain was attached from the microscrew to the first premolar. The microscrews were used as indirect anchorage to prevent mesial movement of premolars during the distalization process. NiTi coil springs were activated to distalize the second molars. After the second molars were distalized, the first molars were distalized into Class I position. The length of the wire got shorter during the distalization process, and the archwire in the maxillary posterior region was changed every four months. The premolars were distalized after the first and second molars were established in Class I occlusion. The maxillary left molar distalized faster than the right side because the microscrew on the right side got loose five months into the distalization process. The oral surgeon decided to wait for few months before placing another microscrew. It took 10 months for first molars to get into Class I position. After the molars were in Class I relationship, a 16x22 SS continuous archwire was placed in the upper and lower arches and the microscrews were removed. 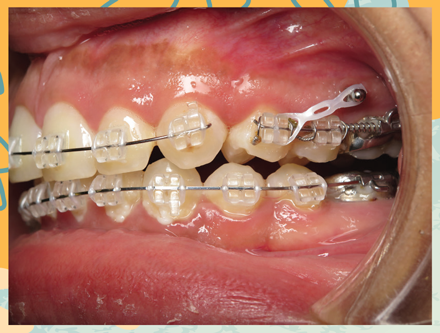 Class II elastics were used for a short time to establish canines in Class I occlusion. The estimated treatment time was 24 months, but the actual treatment time was 36 months because the patient missed several appointments because of child bearing and delivery (Fig. 3). Fig. 3. Posttreatment pictures and X-rays. Many adults are seeking orthodontic treatment in pursuit of healthy, beautiful smiles. Adult patients with complex malocclusions also have very high expectations. A combination of all these factors makes it important for orthodontists to offer several treatment options to provide the best outcome. Many factors play a role in selecting the right treatment option for adult Class II patients. Conventionally, the orthodontic treatment of adult Class II malocclusion patients involved either the surgery option, the extraction option or the use of intraoral distalizers. The surgical mandibular advancement option is the best option for patients with a retrognathic mandible.4,5,6 However, surgery is invasive and adds additional cost to adult patients. The risk from surgery and additional cost of surgery could be a deterrent factor for some adult patients seeking to correct the Class II malocclusion. Some authors have reported difficulty in distalizing first molars with intraoral distalizers in adult patients, because of the full eruption of second molars, which involves the distalization of the first and second molars. This can cause extrusion of posterior teeth, which has a countereffect in correcting the Class II malocclusion.3 Thus, case selection and the proper treatment plan are very important to get the best results. Considering the facial profile, soft-tissue thickness and the cephalometric numbers, our patient was not an ideal candidate for surgery. Even though the ANB was 4.7 degrees, she had a well-balanced facial profile. The extraction option was not the best choice for her, either, because she already had dark corridors from the square arch forms. There have been conflicting reports that extraction of premolars can cause narrowness of the smile and create dark corridors.7 Thus, distalizing the molars with microscrews was the best option. The intraoral distalizers were not considered in this case because they have the disadvantage of extruding the molars. Microscrews provide an excellent choice in correcting Class II malocclusion in adult patients without the need of surgery, extractions or the intraoral distalizers. Microscrews provide a light continuous force without the need for patient compliance and can be used as direct or indirect anchorage. In this report, we used a microscrew as indirect anchorage to distalize the maxillary molars. 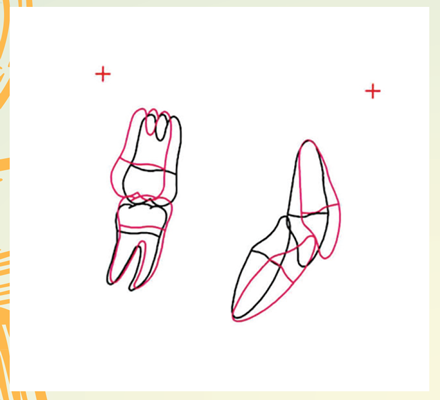 The maxillary second molars were distalized in Class I occlusion before the premolars and canines were moved into Class I occlusion, to limit the risk of anchorage loss. The maxillary molars distalized by 3 millimeters (Fig. 4). A slight intrusion of the maxillary molars was also noted. The pretreatment maxillary and mandibular anterior teeth were retroclined and the correction of crowding caused the maxillary incisors to procline by 12 degrees and the mandibular incisors to procline by 17 degrees (Fig. 5). The maxillary anterior teeth proclined to ideal position and the mandibular anterior teeth proclined slightly excessive than the normal. The proclination of the anterior teeth helped in reducing the deep bite. After the molars and canines were in Class I occlusion, a slight excessive overjet was noted due to Bolton’s discrepancy. Patient was given the option for interproximal reduction in the maxillary anterior teeth, but she declined. Patient was very happy with her smile aesthetics. Absolute anchorage with microscrews has been successfully used by several authors to correct molar relationship in adult Class II patients.8,9,10 Selecting adult patients with well-balanced facial proportions and using the appropriate biomechanics for distalizing molars with microscrews can greatly improve the treatment efficiency and outcome. Thus, absolute anchorage using microscrews can provide an excellent treatment option in correcting molar relationship in adult Class II patients. Fig. 5. Superimposition of teeth. 1. Uribe, F.; Nanda, R.: Treatment of class II, division 2 malocclusion in adults: Biomechanical considerations. J. Clin. Orthod. 37: 599-606, 2003. 2. Dalangol, S.L. : Angle class II, division 2 malocclusion treated with extraction of permanent teeth. Dental Press J Orthod. 16: 125-135, 2011. 3. 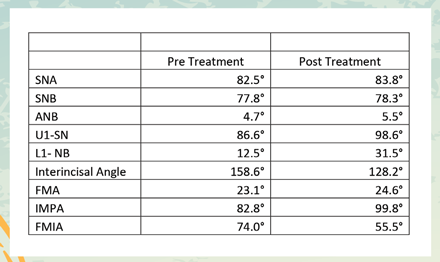 Fontana, M.; Cozzani, M.; Mutinelli S.; Spena R.; Caprioglio A. : Maxillary molar distalization therapy in adult patients: A multicentric study. Orthodontics and Craniofacial Research. 18: 221-231, 2015. 4. Pinho, T.; Figueiredo , A.: Orthodontic-Orthognathic surgical treatment in a patient with Class II subdivision malocclusion: Occlusal Plane alteration. AJODO. 140: 703-712, 2011. 5. Proffitt, W.R.; Phillips, C.; Douvartzidis, N.; A comparison of outcomes of orthodontic and surgical-orthodontic treatment of class II malocclusion in adults. AJODO. 101: 556-565, 1992. 6. Pancherz, H.; Ruf.S. ; Erbe.c. ; Flansen. K. : The mechanism of class II correction in surgical orthodontic treatment of adult class II division 1 malocclusion. The Angle Orthodontist. 74: 800-809, 2004. 7. Bowman, J.S. ; Johnston L.E. : The Esthetic impact of extraction and non-extraction treatments on Caucasian patients. The Angle Orthodontist. 70: 3-9, 2000. 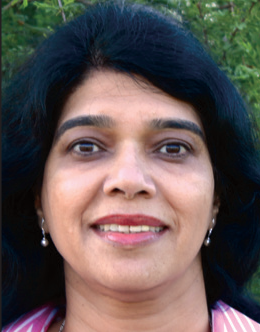 Dr. Saritha Chary-Reddy received her DDS with honors from the University of Oklahoma Health Sciences Center, and also has earned a PhD in the field of genetics. During her specialty training in orthodontics and dentofacial orthopedics at the University of Texas Health Science Center in San Antonio, she received a Best Scientific Presentation award for her research in genetic disorders that relate to tooth and facial disorders. Chary-Reddy is a diplomate of the American Board of Orthodontics, receiving board certification in 2006. Her professional affiliations include the American Association of Orthodontists, the Southwestern Society of Orthodontics, the American Dental Association, the Texas Dental Association and San Antonio District Dental Society. 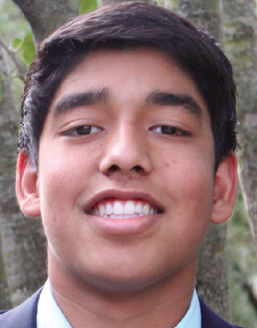 Aspiring dentist Karthik Reddy currently is an undergraduate student at Trinity University in San Antonio, Texas. He works as an intern with Chary-Reddy at VK Orthodontics during the summer.